Posted July 23rd, 2012 by Yvonne Hawkey & filed under Loudspeakers. The big boy of the Elan range and one that takes the basic ingredients of the classic Elan 15 and extends them. 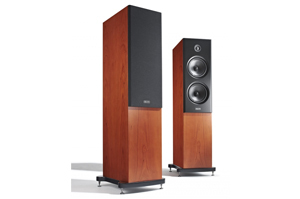 These speakers can really fill a large space with ease on a scale that belies their modest price. Weâ€™ve had great results with some pretty powerful amps, however they also respond really well to the sweet and punchy sound of the gorgeous Leben 300XS valve amp.